Robert is a consummate professional. An energetic, captivating speaker who has a passion for his topic and the experience, knowledge, and skill to back it up. His workshop and keynote were easily the most popular events of our conference. Highly recommend Robert for any company that would like assistance in their creative process. One of the exciting things for me about the games industry is being a part of its growth and maturation, especially with respect to the business side of things. Without a doubt, Robert created one of the best, most principled co-publishing arrangements that I have ever seen, let alone signed. If every publishing and distribution executive applied that much fairness, reason and good faith in their agreements, the games industry would be a far better place for creative people and talent to thrive. Thank you, Robert, for setting the standard by which I judge all other business relationships, and I look forward to working again sometime soon! Rob, you have a talent for taking abstract ideas and turning them into concrete reality. That’s a vital skill for any startup company. In just a few months, you accomplished a lot: you created a world-class brand identity system for Boomer Hottie, you defined the deal structure for our licensing business, and you crafted all of our corporate marketing material and partnership agreements. You are a creative powerhouse. Robert Tercek ranks among the very best speakers I’ve ever encountered. His speeches on the topics of innovation and creativity have influenced industry leaders in many parts of the world. Mr Tercek is an electrifying public speaker. His passion for the subject matter is infectious. In just one hour, attendees gain a fresh perspective on the major trends that are transforming creativity and innovation in industries as diverse as media publishing, technology and telecommunications. More attendees have requested printed text from Mr Tercek’s media and telecommunications keynote speeches than any other speaker. Robert Tercek commands the respect of the global media industry, his peers, and countless conference attendees who have heard him speak. What sets him apart is that rare combination of visionary thinking, hard won practical insight, and tireless passion for the way media shapes our world. It was a privilege to have Robert speak at this year’s seminar. He lit up the room. What’s more he created a customized presentation, tailor-made hand-outs, and promoted the event using his own online show and social media clout. Make no mistake, Robert is far more than an inspiring keynote presenter. He is a catalytic partner committed to the success of your event. We were fortunate to have Mr. Tercek as one of our keynote speakers at our premiere national industry conference, Prime Time in Ottawa, in 2011. Our delegate feedback to his address was so positive that we invited Robert to speak again at our event in 2012. 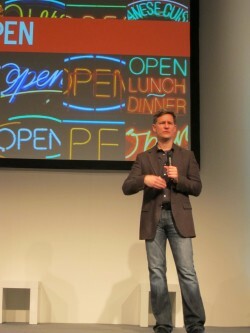 Robert Tercek is a leading speaker on media innovation and creativity. His insight on the latest global media trends and his extensive experience as a producer of leading-edge content across multiple platforms make Robert uniquely qualified to provide strategic guidance to anyone doing business in media today. Not only is Robert keenly aware of the myriad interwoven variables that come into play in the media environment, his presentation style is organized, logical, clear and concise, with just the right amount of humour. I highly recommend Robert Tercek as a keynote speaker for any event that is focussed on the media sector, or for any media company looking for a business strategist to help guide them to greater success. University was excellent. Tercek provided valuable insight, a fresh perspective, and useful examples, all in an entertaining format. He worked closely with the event organizers to tailor his talk to the target audience; and the audience responded with a standing ovation and tremendous positive feedback. We were very lucky to have him! Robert Tercek is one of the most popular speakers we’ve ever had at X Media Lab events. His keynote speeches are utterly unique, and they connect with our audience on emotional, visual and intellectual levels. He delivers a compelling message about creativity and life purpose that never fails to inspire the attendees. Plus, he makes an extra effort to support our conference by meeting with attendees and sponsoring organizations in private seminars and one-on-one mentoring sessions, and also by promoting our events to local press in media briefings. Robert is a fantastic and engaging speaker. It takes a lot of courage to speak to a group of Chief Information Security Officers on the subject of the information explosion especially in this day and age. Robert not only brought a new business problem to light but with it, a refreshingly new perspective on ways to address it. The room was energized and awestruck by his presentation. Thanks Robert! Robert Tercek has a keen understanding of how creativity is a necessary and often overlooked aspect of leadership, deal making, marketing, and general business process. He has spent his entire career at the forefront of change, launching entertainment content on just about every digital platform, including cable & satellite TV, computers and game consoles, narrow and broadband internet, interactive TV, and even mobile. As a speaker, Robert engages the crowd with interesting examples and metaphors. He speaks with passion and energy. It is clear that he has the professional background, speaking ability, and personal drive that make him an ideal candidate to address the topics of creativity and intuition in the context of business. It is rare that you find a speaker like Robert who is able to cover a broad topic , put recent developments into an historical context and provide deep and relevant insights into what factors will drive the industry’s future. Further, his speeches (and I have seen a few now) contain analysis backed up by solid research and market data, utilize multimedia a graphics and are delivered with infectious high energy and passion. His keynote speech was nothing short of excellent and drew from his 20 years of experience with cutting edge formats like mobile games and online games as well as social media, interactive television and traditional broadcasting. It is without hesitation that I recommend Robert as a keynoter speaker. CEO & Publisher, Digital Media Wire, Inc.
What a wonderful performance last evening!!! Obviously the audience loved your material and presentation. On behalf of The Economic Club of Oklahoma, thank you so very much for taking the time to come to Oklahoma City to speak to the group. Your speech was one of the best our club has ever had. Robert Tercek delivered a talk at the 2011 Storage Visions Conference that was as technically insightful as it was visually stunning. The talk was delivered with great enthusiasm and covered a wide span of historical and contemporary technologies and trends to show how the world is undergoing an enormous “Information Transformation” that is enabled by and initiates vast new networking, processing and storage advances. From the moment Robert got on stage the audience was fascinated and so was I. He conveys such magic and power through his words. His content, full of surprising references, was compelling, and the structure and exciting story of his lecture were remarkable. But most of all, what came across to the audience was his profound wisdom about life with all its failures and successes and the attendant lessons. Robert is a top level speaker who affects you so deeply that you will never forget his words. Robert, your talk was inspirational. Mythology, metaphor, magic, mystery – as you said so eloquently in your talk – give us the tools to nourish our selves as we play. Great, great stuff. Rob Tercek has spoken several times at various Billboard digital entertainment events, including the Digital Entertainment Expo, and Mobile Entertainment Live. He has consistently brought both passion and clarity of ideas to each appearance, which have included both solo presentations, moderating duties and panel appearances. In each case, Robert has always been very forward looking in his comments, supporting his predictions with multiple sources and analysis based on available research. His presentations are always fun, personable and easy-to-follow whether he’s just talking or supported by multimedia assets. As an aside, Tercek served as a valuable source of advice for building our conference topics… often recommending topics and speakers outside his area of individual participation. Robert is the reason I am in new media. After hearing him speak at a digital event many years ago, he inspired me to want to contribute to the industry. 8 years later I am still launching services in the new media sector. Thank you Robert. Robert generously gives of himself and shares his experience, knowledge, and deep compassion for those around him. As a visionary, Robert is able to see into the future and identify how companies should evolve and grow. Speak with him if you want a glimpse into what life with be like months or years ahead. I have had the good fortune to work directly with Robert, and if you ever get the chance to work or spend some time with him, I suggest you take advantage of it. Robert is a visionary. Beyond recognizing brilliant ideas, his boldness and determination inspire others to take risks. I have yet to meet a more persuasive and powerful presenter of ideas. His infectious passion and dedication to driving innovation have pushed me beyond my expectations. If I were to choose only one brainstorming partner, it would be Robert. Thanks to Robert’s efforts, we had a highly successful “reboot” of our product pipeline that was well received by all of our distribution partners and the Board of Directors. He ran brainstorming sessions, design reviews, creative workshops and product design sessions along with roundtable discussions with the product and development teams. The result was that we revised the entire product lineup and set new delivery dates. Robert, myself and the senior management team then conducted near-term and long-term planning sessions for the release and marketing of the new product lineup, and we reviewed progress weekly against milestones. Very few individuals could have accomplished this. Robert’s level of professionalism and his passion to create market-leading digital products anywhere in the world are unparalleled. It is also important to note that self-motivated people enjoy working with Robert very much, and he can leave a profound long-lasting impact on a product team. President and CEO, Vindigo Inc.
As a startup, one of our biggest challenges is weighing opportunity against focus. Rob’s workshop helped us extract fresh ideas from our team and reinforce mutual ownership and clarity of our vision. Applying such a dynamic creative thinker to our business processes continues to deliver incredible value. As our Strategic Advisor, Rob helped craft a process by which we could identify and think about divergent concepts, giving them an opportunity to be aired. This was coupled with a convergence process, which we use to vet and prioritize these concepts in line with our company’s vision. Chief Strategy Officer, Xen, Inc. Engage this man (if you can) to consult to your company at length, or even to take the most cursory glance, at whatever you are endeavoring. Robert Tercek will make your media and/or global entertainment enterprise better, smarter and more profitable. Robert’s a creative genius who firmly grasps everything from the big picture down to the details and knows how to get things done … he’s just an all-around great guy. A poster child for “out of the box” creativity. If you want to turbocharge your creative, innovative thinking, think seriously of contacting Robert. Hey, if he’s good enough for Oprah, he’s good enough for you. Rob was a great and close partner for us. He brought phenomenal technical expertise and vision, and he also brought an excitement and fun to doing business together. To his personal credit the business was always done as a highly professional, open, fair and mutually beneficial partnership. Highly recommended! The label ‘creative’ has become so commonplace that it’s lost its impact, but Robert is the real deal: his spark electrified every project at MTV. There were awards & accolades, but for me, the greatest accomplishment is how his work redefined the way TV was presented in Asia and opened the eyes of an Asian generation of 3 billion when satellite TV first beamed across Asia in 1991. Robert infuses a careful combination of creativity, expertise, & excitement into every project we worked on together! He understands what the market wants and has the experience to prove it. I look forward to collaborating with Robert in the future! Robert is quite simply one of the most inspiring people I have worked with and is a true visionary in every sense of the word. He really is a unique individual – someone who is well known and respected throughout the entire interactive industry. I feel extremely privileged to have worked with him. He was always ready to listen to new ideas and is one of those people whose finger is not only on the pulse but is the pulse! It is rare to work close with someone of Robert’s qualities. I’m sure many other people would say exactly the same as me. Rob is one hell of a guy: utterly inspiring, extremely visionary, very knowledgeable, humiliating scope, international awareness across many different cultures and great fun to work with on top. If you need insight into the mobile media space, if you crave for original thought, if you dare thinking beyond just the next step, he is your man! Robert is truly a visionary and an inspiration. He has a gift for always being one-step ahead of the pack. Follow Robert’s lead and you follow the future. I look forward to collaborating with Robert again. President & Co-Founder, Ogmento, Inc. Rob is a pronounced thought leader in mobile and digital entertainment environments. I have consistently valued his strategic authority. He is the Steve Jobs of mobile, and the first person I call in the space. Rob is one of the most lucid, knowledgeable and charismatic new media executives I have encountered. He also has an uncanny ability to instantly recognize the market potential of a new application or business which would be too impenetrable to most. Internationally, Rob stands amongst the few true visionaries in the digital entertainment field. Robert is one of the brightest and most energetic executives I have had the pleasure of working with in my entire career. He is very well informed, he has vision and he is always looking for ways to make his efforts and those of his team the most successful in his industry. He is very worthwhile knowing and meeting. Collaborating with him will be rewarding. Rob is inspiring to work with. Just hearing the passion in his voice and literally watching his mind work makes anyone in the creative world jealous. It is an exciting ride to work with Rob. You can’t help but to follow his vision. Scott Jensen, President & CEO, Vindigo Inc.
Ned Sherman, CEO & Publisher Digital Media Wire, Inc.